What a fantastic Easter break Luke and I had this year. It was actually the first year we haven't camped in a long long time but we still had a fantastic time in...Warwick, Queensland. We made our way out to Warwick from home along the Cunningham Highway. This would have to be one of the best drives in south-east Queensland. The scenery is spectacular and the little towns dotted along the way make a great place to stop and explore (more on that later). We arrived in Warwick on the Thursday afternoon before Good Friday and happily relaxed in the sunshine. I love that Warwick is always that bit cooler than Brisbane and I loved snuggling up under the doona. The next day we set off to tackle the Condamine Gorge track from Killarney to Queen Mary Falls. This would have to be one of the best 4wd tracks we have done in a long time. There was lots of easy little river crossings and the scenery was lush and green. Just amazing! I would be more than happy owning a little cabin in the bush here. 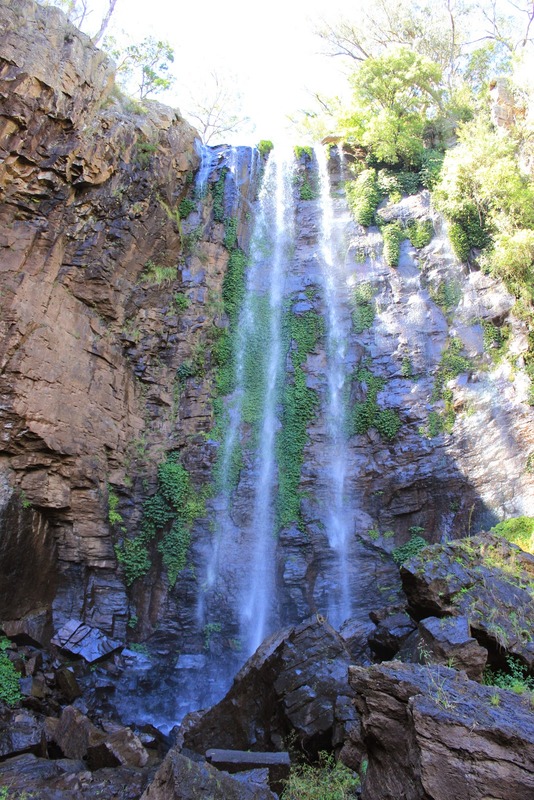 When we arrived at Queen Mary Falls carpark we made our way along the track to the falls themselves and we were just so lucky to have such a beautiful day. Not too hot and not too cold and the falls were running. We were covered in spray every now and again as Luke practiced his photography skills on our new DSLR camera. We celebrated our little trek by having a leisurely lunch at the cafe across from the carpark at the caravan park and I spoilt myself by buying a little WoodWick candle. Another beautiful day in Warwick! The next day we headed to the Easter markets in Leslie Park in Warwick and once again I couldn't resist buying a cute little geranium, and some lovely wood work pieces (a honey wand and bread board). It was a beautiful cool but sunny morning and we decided that on the way home we would stop in at Glengallan Homestead which is just outside Warwick heading back to Brisbane (just on the Toowoomba turn off). I had no idea that this place even existed but I was so glad that Luke and I decided to check it out. The grounds and views were stunning and the homestead itself helps you realise how nature can reclaim any property if left without care. The homestead is slowly being restored and the story of the families who have lived and worked there is just so interesting. P.S. I also saw and owl on the verandah (the first time I have seen an owl in real life). We also made a stop at the top of the range and took a stroll to the lookout. On our way home we stopped in at Aratula for lunch and a quick squiz at the antiques shop there. We purchased some beautiful local honey and lost ourselves amongst all the antiques for a little while and dreamed of all the things we could make and do up in that place. All in all a fantastic break so close to home and one I would recommend to anyone. I will definitely being doing it again. I may not have mentioned this before but I have discovered that I am a lover of soap. I am not talking pump action, foam producing, marshmallow smelling soap...I am talking coconut oil, honey, mint, natural ingredients with zero palm oil and sulphates for those souls, like myself with sensitive skin. To quote a much used line, recent studies suggest that antibacterial soaps may encourage the growth of 'superbugs' resistant to antimicrobial agents, a problem when these bacteria run rampant, turning into dangers infection that cannot be treated with available medication. Now that the technical stuff is out of the way, I also simply believe that soaps are better for you and your skin. Full stop. That's it. I am talking about locally produced soap from natural ingredients. I am even thinking of making my own soap...what this space. But until I do, I just have to tell you about some fabulous soap I have discovered. Firstly is the shampoo bar I use from Beauty and the Bees where they make everything from scratch, in house, in Tasmania and I am not just talking about soap either. You can also buy some of their products from Biome. Their products are 100% chemical free, luxuriously rich, really work, and are ethically handmade. Next is the amazing soaps you can get from Odgers & McClelland Exchanges Stores which was established in 1891 and is located in Nundle, New South Wales. I love the lavender, bergamot and sandalwood soap but you can also get cinnamon and oatmeal, sea salt and rose and vanilla to just name a few. Once again they don't just sell amazing soaps but also amazing enamelware. Lastly, I have even fallen in love with soap remnants/leftovers which you can get from Biome in a cute little hemp crochet bag. These little delights are just perfect for a guest bathroom and really do last for ages. You can see that I also have heaps of fun with my soap dishes. I just love vintage or reproduction blue and white English china but the options are endless. I have even seen the cutest little wooden racks. Keeping your soap dry between uses makes it last longer (as a little tip from me to you). Bars of soap are cheaper, last longer and are better for your skin then other products so I hope you get as excited about soap as you can see that I am. In the last 6 months or so I have become more conscious of what I buy, use and throw away. I was truly astonished at the money I spent and the waste I produced. I made the conscious decision to do more. That is take the time to make things from scratch using natural products and limit the rubbish I produce. I now make my own bread, I use fabric wraps or reuseable containers to take my lunch to work, I have a vegetable garden, I compost my food scraps and I use all natural beauty products and cleaners. I do realise that some of you may think that I am a bit (or a lot) late to this party, but at least I have arrived! Don't get me wrong, I have not given up chocolate and starting eating cacao nibs (that is sacrilegious to me) or using crystals as deodorant (not that there is anything wrong with that - who am I to judge), but I have made a few changes to my life which I am happy with. Now you all know my love of crochet so I decided to make my own dishcloths and pot scrubbies. I purchased a cotton microfibre yarn from Blacksheep Wool n' Wares and decided to fancy it up with a fan and post design crochet pattern. I followed this pattern from YouTube and I was really happy with the results. For my scrubbies I just used some leftover Zpagetti yarn I had around and crocheted some small circles. Dishcloths and scrubbies are a great way to start learning to crochet, you get fast results and something that you can use time and time again. If really hope this post has inspired you to think about the money you spend, the rubbish you produce and the chemicals you put on your body. If you are interested in getting more information head to Rhonda Hetzel's Down to Earth blog or visit the Biome website for inspiration. I am sure there are many other useful links but these are both local sites which I have enjoyed. Just changing one thing in your home can make a difference, I swear! My friend Summer and I decided that we wanted to learn macrame after seeing this amazing post from A Beautiful Mess. I must admit that I had been thinking about trying to learn macrame for a little while now. Probably since I was lucky enough to win an Ouch Flower macrame plant holder made from Zpagetti a few months back. We were lucky enough to time our desire to macrame with a class being held at Reverse Garbage. I go a wee bit crazy every time I am at Reverse Garbage and this time was no exception (I made sure we arrived early). Fabric and terracotta pots for my soon to arrive bulbs were the order for this day. Everyone at the class was lovely and really willing to help each other. We decided to keep it simple and use jute twine with recycled wooden beads to make a tea light candle holder and this was the result. Not too shabby and just what my deck needed. After this class I now feel confident in applying my skills to other macrame projects. Summer is away and flying. She had the idea to make a bird feeder out of an old coconut shell. I haven't seen it yet but I am imagining something like this below from Poppytalk. If you ever get a chance to attend a macrame class or any class at Reverse Garbage give it a go, it was good fun with a few laughs and clumsy moments from me as always. I do realise that it seems a bit strange to be crocheting a scarf when it is still summer here in Brisbane and well over 30 degrees at that. However I do have a good excuse...I am preparing for our big trip to Tasmania at the start of winter this year! I am so excited about seeing a bit more of our great big country and I have always wanted to see Tasmania. We will be there for three weeks and travelling all over this beautiful little state and I just know that I will need a lovely warm and woolly scarf. Now I was lucky to have a skein and a half of Wool Ease chunky yarn leftover from another project and that was all I needed for this beautiful infinity scarf. I followed this gorgeous pattern from Fiber Flux and was not disappointed. It was so easy to follow and if you are just starting out she even provides a step by step video. It feels so cozy around my neck and I know it will be great for winter. It would also make a beautiful handmade gift that is quick to whip up but looks amazing (it seriously took me only a couple of hours). If you are new to crochet then give this project a go, you will be amazed at how quickly this comes together. Yay for crochet! A big thanks to my Dad and Mum who instilled in me a love of books. They were the ones who introduced me to Enid Blyton. When I was a wee girl I loved loved loved 'The Folk of the Faraway Tree'. I remember wishing that I would come across the Faraway Tree when I was out and about. I still love the idea that the Faraway Tree is out there somewhere. Recently I was reading a fiction novel by Marcia Willett when she mentioned a book called 'The Little Grey Men' by BB. It is about the last four gnomes in Britain. BB was the pseudonym on D.J. Watkins-Pitchford on a side note. The book was first published in 1942 and is simply...brilliant. I really could not put it down. I needed to know how Cloudberry, Dodder, Baldmoney and Sneezewort finished their big adventure. They are the names of the last four gnomes in Britain by the way. I cannot recommend this book highly enough and I know that you will love reading it yourself as much as to your children, nieces or nephews. I bought the book on bookdepository.co.uk and was not really expecting too much but I had a lovely surprise and now I love to think that Cloudberry, Dodder, Baldmoney and Sneezewort are chatting by the fire in Oak Tree House by the bubbling Folly brook. Please read it when you get a moment...you will escape to a beautiful place. The super talented Luke has been at it again (with his trusty apprentice who tries really hard...me). He has been going crazy for pallet projects. Pallets are a really inexpensive way of getting great looking rustic timber with loads of character. Many places give them away for free or talk with some local builders in your area and maybe they will be kind enough to give you some (remember ask with a smile). I also sometimes see businesses in industrial areas giving them away for free (it really helps to have a ute in these situations...we are very lucky in that respect). One pallet project that I love is the wheelbarrow garden planter by Steve Ramsey. Steve is a fantastic vlogger with a very helpful website. Luke used his plans to make this amazing planter for me. You can even watch Steve himself make this super cute planter on his YouTube channel. We have put the planter in our front yard and put a few annuals in there. I went with some classic petunias in purple and pink tones but I think any plant would look amazing. I am trying for a cottage garden theme so petunias are a cheap and cheerful way to achieve that look. Hopefully I can put a few plants in there that I have grown from cuttings but more on that sometime later in the blog. If you are a handyman or woman give a pallet project a try and Steve will certainly give you some inspiration. I must admit I am a little bit obsessed with quite a large number of blogs at the moment. I really enjoy reading about how other people live and what makes them tick. This coupled with beautiful and interesting photos ensures I enjoy a blissful few minutes each day being inspired (or sometimes jealous really). One local Sunshine Coast lady who has an amazing blog is called Rhonda Hetzel. Her blog, 'Down to earth' makes me want a more simple existence where I get real satisfaction from the actions I perform as opposed to what I buy/consume. With a few chickens thrown in too. I was so inspired by her blog that I bought her book known by the same name (I just love the feeling of a good book in my hands). I want to try so many things from this blog/book (like making my own soap) so I will bring you the results of my trials and tribulations over the coming weeks (even if they are disastrous). I really, truly, honestly recommend this amazing blog for ideas and guidance on saving and spending, housework, gardening and cooking. Rhonda is the first to acknowledge that not all her ideas are for everyone but she imparts to others what has worked for her in her own situation and hopefully people can use that experience to help find inspiration to live a more simple life. Rhonda has certainly made me think twice about what I buy (although I could not resist a beautiful Monty Don book - more on that later). Anyway, please take the time to have a peak at Rhonda's blog and hopefully you can be inspired at least for a few minutes each day. Well you have probably guessed from my previous posts that I am a little bit obsessed with gardening. I just love love love it. I find it a great way to relax and enjoy the sights, noises and smells around you. I am a huge fan of visiting other people's gardens to get inspiration (I even visited a garden that had huge dinosaurs in a tropical setting - pretty scary). I also find it a really fun adventure. Most of the gardens I have visited have been in places I haven't been to before and are absolutely enormous. Believe me when I say that you can have a wonderful day out visiting some of these amazing gardens and everyone I have met has been so friendly and helpful with all my questions. A great way to find gardens to visit is via Open Gardens Australia. They have a calendar of events in each state and you will find that most open gardens also have little stalls, food and other activities. I really look forward to the big plant fair each year. There are so many wonderful stall holders with little treasures you probably have not seen before. And believe me when I say that it is not just limited to plants although the variety of plants you can find there is staggering. It was at just one of these fairs that I was inspired to add garden ornaments to my own little garden. I have added mushrooms, mice, chickens, old logs, stones, pots, a bird bath and a bird feeder (I am a little obsessed with trying to attract birds and bees to my garden). Look at my little bird feeder there above the Elderflower. The Noisy Miners are certainly loving the Coconut Ice Grevillea and the bees are loving those giant Elderflower blooms. Some of the garden ornaments I have found have made there way into my home. One such thing are the mushrooms made by Woodrock Turning. I have linked to their Facebook page but you can also find them on Etsy. They are just so gosh darn cute. I hope my little effort at garden fun has inspired you to maybe give it a go. Think of making a fairy garden for your little wee ones or adding some beautiful pot decorations for those with limited space. Or what about making a crazy character from collected branches. Just so much fun to play around with. Have fun! The very handy Luke and I recently bought a new BBQ. We decided on a little Weber Q but we were not sure what to put it on. We were not massive fans of the standard Weber stands, and other stands we found were just not our style. I decided to have a look on Gumtree for an old Singer sewing machine stand. Now my parents do have a lovingly restored Singer sewing machine stand so maybe I had that in the back of my mind. There have been a lot of different types of Singer sewing machines over the many years and this lovely blog has some beautiful illustrations and interesting information. Some are extremely rare. If you are lucky you can find a type that really suits your style and budget. I was lucky enough to pick up one from a lovely gentleman for $50 and my awesome Dad helped me to pick it up. Now it was not in the best condition when we found it. It was in pieces and very rusty but completely salvageable. Luke had to file off the rust first. He did this with a drill and a metal rasp type attachment. I promise I did give it a go but I just could not get the hang of it. This certainly took a few hours but the results were worth it. We could have arranged for an acid dip or the like but this way we got a real sense of achievement. To avoid rust in the future and to return the stand to its former glory, we sprayed the stand with Kill Rust gloss black spray paint. We made sure the stand was together before spray painting it so that the bolts were matched to the frame. We did need to source some new bolts but our second home (Masters) definitely helped out with this little task. The other thing that we needed to source was a table top to put on top of the stand. Luke and I just love old rustic recycled timber so we headed to our local Big Red Shed. The lovely gentleman here pointed us in the direction of an old saw table. It was just so beautiful and all we did was cut it to size and give it some oil and that was that. Our new BBQ had a beautiful new home. My name is Meagan and I am a trier. If you are like me, you love looking at things to make and do however when you give it a try, it doesn't always seem to turn out the way you wanted and guess what...this is perfectly great, in fact it is fantastic fun. This blog is about trying things to make and do together and sharing our varying results because there will be many. I long for a more simple life so this blog will showcase this. I will try gardening, cooking, crafting. I will also share some things that are close to my heart and hopefully yours as well. I hope you enjoy my blog xxoo.